The last light of day skims across the farmland in this snow-covered valley. I came to a quick stop in order to jump out of my truck and capture this fleeting moment.Less than five minutes later,the sun had dropped below the mountains and the cold of evening began to envelop the region. 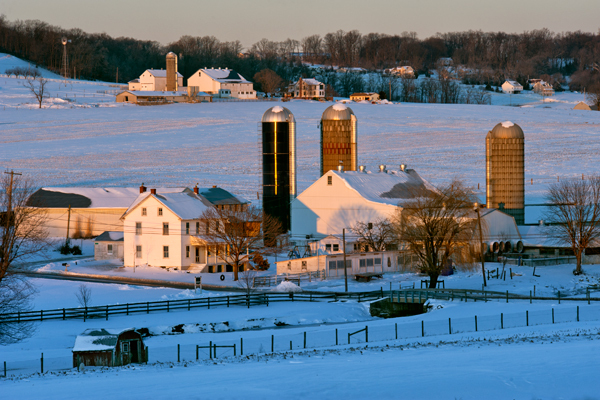 This entry was posted in Amish, Landscape, Photography, Snow, Winter and tagged Amish, Farm, Glowing, lancaster county, Landscape, Photography, Snow, sunset. Bookmark the permalink. Awesome view. Beautiful shot thanks for sharing with us. Great landscape, I really like how the light kisses the buildings. Fantastic panorama! This brings me back to living in the country with my parents in rural Manitoba. Your photos are some of the best I’ve ever seen–I kept trying to decide which ones I had photographed but the results were not like yours—you must have a 4-wheel drive, snow tires, & have a real passion for your art–I’m glad I didn’t end up like Augusta after my fall.